The ending is not a fairy tale ending. If anyone's expecting this. Haha I went to Sun Plaza to watch, and there were almost no people there. The music was eerie, but coolly eerie. Orlando Bloom performed exceedingly well for this. He has improved from the dumb looking guy from the first. Maturity. My favorite is Jack sparrow. Depp plays him effortlessly. He went up in a cannon for the whirlpool part! Wow. I liked all his fight scenes. Depp looks the best in POTC. Keira's my most favorite woman in the whole thing. She was innocent as Elizabeth, then became more gutsy. She's so cool as a pirate queen, brave, but certainly not unfeeling. When she screamed for her dad and James that was so heartwrenching. She's equally great at fighting. The accent is so perfect too. I think Jerry Bruckheimer wanted to put this up as a message: life does not go the way you want. But you make the choices and if you win, it's to your credit. Choices! The myth of Calypso is entertwined and wonderfully incorporated. Not all will understand, I'm glad I did. I'm a fan of mythology, she's the sea goddess. In Odyssey, Charon was the pool and Scylla was the mate. Hmm, but close enough. Calypso is one furious witch! Swashbuckling action, not cliched pirate movie at all! Woo! Go for it. Pirates 3 trailer from disney;s! This is the entertainment for fans of mythology. Play with the powers that give you great advantage over your opponents, choosing Egyptian, Greek or Norse gods. Norse is the Viking gods. Like other strategy games, you have to balance resources meted out to soldiers and civilians. I was hooked just watching people farm fish, dig gold and cut trees in idyllic music. They help you to relax as if you were on holiday. The hardest civilization to manage is the Norse who need to increase their prayer points by fighting. In the beginning, there will be extra heavy casualties to your army. I hardly manage to win. But the pluspoint is the formidable Goddess of winter, sometimes fire, Freya. She grants you ice monsters that are incredibly hardy. Another plus is the healing fountain so your men can heal when they are injured, thus saving effort and cost of replacing your dead. There are many to choose from---- earthquakes (by Ra), meteorites (by Zeus), typhoons (also Ra) and lightning storms (Hera). These are the strongest magical elements. To ensure you get these, type Wrath of the Gods. Other powers you wield help you to buy time, or change the weather like make snow to freeze the civilians or sending a plague. The code Pandoras Box toggles among different abilities. Without the cheats, you could still get the strong powers but you will need to upgrade to Age four after building the market. So using the cheats make it less tedious. You can win your opponent(s) by unleashing storms alone. Saves on manpower and casualties. Players can use heroes from any of the three countries. There is Perseus, Arkantos and Chiron from Greek. Egyptian heroes are the pharaoh and the priests. Norse have two kinds of heroes only, the dwarf warriors and the Hersirs. You got to take care, because the latter two heroes cannot heal and return to life. Norse heroes double up as building units. Great losses if you get them in the frontline! Minotaurs, centaurs shooting arrows, raging wolves, ice and fire monsters are just some of the mix. Most interesting are the Norse creatures, they are more powerful than greek. Greek myth units are suitable for long distance defence only. Nemean lions and chimera, fire fish, are better but you must choose wisely. Definitely there will be experimental after you finish the campaigns. The heroes journey from Greece to Egypt, in order to fight the enemy at Hades. That is a very short campaign. Some heroes, like Chiron gave up their lives to save their friends. The plot is moving and thrilling. The new one is the Golden Gift, the Norse campaign. That was only 3 levels, which I was not done with. The random maps offer spice and action. You can opt for larger maps, toggle and choose your god and the others’ gods. If you want a more challenging time, put that as an option. In hard level, the enemies rush you. The formats are conquest, lightning wars, deathmatch. Lightning wars mean you need to build resources quickly and defend your territory before the enemy sends his troops. For deathmatch, you just fight and not worry about the gold, food and wood. Use the cheats if they run low. Villagers can just be a backup supply and building unit. Melee cannot be cut down as fast as archers. I discovered siege machines were useful, but fragile. Guard them or they will be destroyed very quickly. Usually I prefer to make myth units than sieges. Some of the codes call out bears(O Canada), Walking berry bushes, goat- turning and get forkboy. They make weird animals to help you. 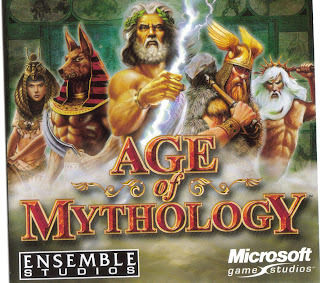 I played age of empires too, which was the brother to this game. But this one is close to my heart, because I love fantasy and have always loved the many deities and religions of the ancient times. The sequel, the Titans expansion pack, has released in the States. I can’t wait for it to come out here.